My grandparents came to Venezuela back in 1948 with 2 little girls, a few bucks to their name and hearts full of hope. They had arrived to a very prosperous country that welcomed them, and all immigrants, with open arms. It was a time when a lot of Americans arrived to Venezuela’s western coast to settle into oil camps. My Grandparents lived happily with their family and friends in their close knit community, where everyone was from the U.S. or “Americanized.” This meant that there was very little need to speak Spanish fluently, with store clerks that spoke English and "American" schools for their children. As the years passed, 2 new little girls (including my mother) were born in this new country. To them, growing up in Venezuela and often visiting family in Texas offered the best of both worlds, from which they created a dual-culture all of their own. 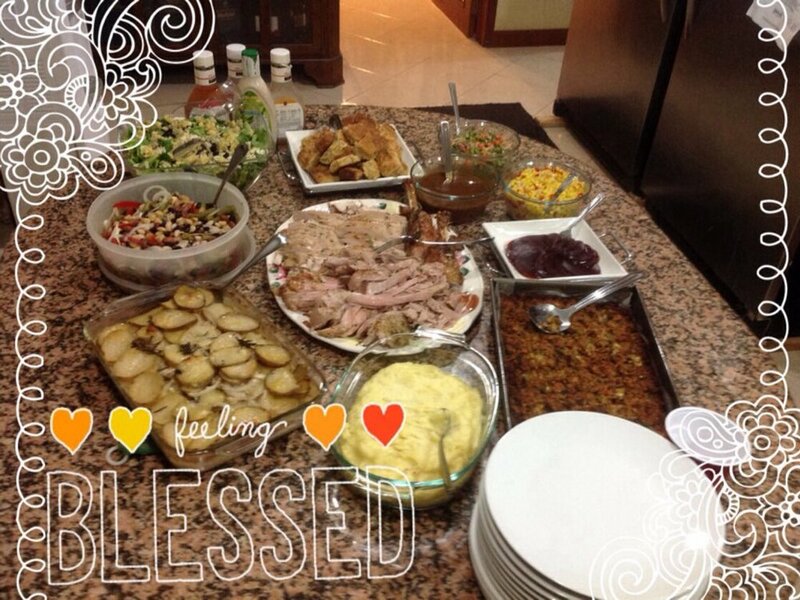 One of the greatest examples of this dual culture was our very own Venezuelan Thanksgiving. Thanksgiving, although a popular U.S. Holiday, is not celebrated in Venezuela and back in the 1950s it was difficult to find some of the wonderful holiday staples that are traditional to the meal. Through frequent trips to the U.S. and the advent of canned goods and boxed mixes, however, my grandparents made it a mission to celebrate this beloved holiday. As the years passed, and their children and grandchildren grew up, this Venezuelan thanksgiving became a tradition that evolved to reflect us as a family and it is one of my fondest childhood (and adulthood) memories. Thanksgiving dinner was always celebrated at my grandmother’s home in La Concepción, a small town in the outskirts of Maracaibo. My grandmother was the Queen of Thanksgiving, a holiday that was hers to do with as she pleased. There were no other events, no juggling of dates or family members, and everyone was welcomed with open arms. However, you always had to make sure you had enough room for that pecan pie! As many of you know, hosting a holiday tradition in a different place has to come with some adjustments, but maybe that is what made our Venezuelan Thanksgiving even more special. As you can imagine, celebrating a holiday on a Thursday was next to impossible, with their married daughters, grandchildren, and eventually great-grandchildren all on Venezuelan calendars. Celebrating on the Saturday after Thanksgiving was the first compromise. The Menu The food was another place where new traditions would evolve. Apples were not that popular in Venezuela until recently, so apple pie was never that prominent, but the pecan pie and pumpkin pies were ever-present. With the addition of new family members, new Venezuelan recipes came to accompany the traditional fare and my grandmother picked up a few tricks from Venezuelan cuisine along the way. It wouldn’t be turkey day without the bird, and thanks to some enterprising businessmen, turkeys were available in select stores in town. The dressing was cornbread, of course, made with Funche La Lucha, (the closest thing to coarse yellow corn meal) baked with vegetables and turkey stock and served with giblet gravy. We later switched to Cachapa mix (corn pancake mix – deliciousness) to make the dressing, but it was still amazing. Cranberries were canned and jellied, the corn was fresh and fried, and the string bean casserole made with real Campbell’s cream of mushrooms. We also had mashed potatoes, baked beans, pecan pie, pumpkin pie, carrot cake, mincemeat bars, lemon pie, quesillo (condensed milk and caramel flan, and yes it is as good as it sounds) and fruit salad, all made from scratch with the exception of some imported ingredients, and it was all eaten with gusto. Large pitchers of iced tea and café guayoyito (a filtered and less concentrated cup, but it’s still made with some of the best coffee in the world!) finished off the meal. After we served our plates buffet style and we sat down to say grace in several tables across living room and dining room, (we were 20 and counting) and looked down at all this delicious food made with love by grandma and my aunts you could just see her smile, all of her chicks were back in the nest, all that effort paid off. Some of the children and grandchildren of Grandma Cleo. Some compromises were made, but Thanksgiving Sunday Supper was a must, and it was Grandma’s pride and joy. Later on daughters and granddaughters (even me!) started to bring dishes of their own to these gatherings, right until grandma moved back to Texas. Now, we all celebrate thanksgiving in our own homes, celebrating our heritage with our new families, and we stick to tradition, our own tradition of incorporating our loved one’s favorite dishes to this holiday. After all, this is a day for being thankful and counting one’s blessings, and family is the most special blessing of all.